Ground-breaking study from Etailing Solutions and RetailNet Group shines light on CPG growth opportunities online and ecommerce best practices. eRankings was developed to be an essential foundation from both the Manufacurers and Etailiers point of view for how to win in ecommerce. CPG ecommerce is among the fastest growing industries, but is very much in its infancy. The roadmap for success is being charted today. The first annual benchmarking survey exclusive to the ecommerce industry was conducted by leading ecommerce consultancy Etailing Solutions and by leading insights and advisory firm RetailNet Group, and sheds light on this fast-growing opportunity, with specific emphasis on these 5 important areas for collaboration between etailers and manufacturers: Strategic Planning, Category Management, Organizational Readiness, Performance Management and Insight Development. The trade study titled "eRankings 2012” designates not only who is best-in-class, but also helps identify ecommerce industry best practices and key challenges. *Which manufacturers, categories and brands are most important to their customers? *Who is best resourced? Who has the best grasp of logistics? *What are their most important ecommerce objectives? *Which etailers are most insights focused? *Who is the most strategic? Who is the best to partner with to develop best practices? *What are the biggest challenges and opportunities in working with etailers? 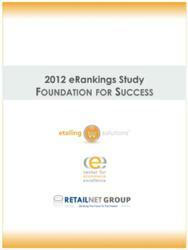 The study also probes many other areas including ecommerce objectives, challenges and shopper needs.